“There might be people living out there, out in the middle of cold dark space, that don't have a Milky Way,” says Harvey Moseley, an astrophysicist at NASA's Goddard Space Flight Center in Greenbelt, Maryland. Astronomers have spotted a faint cosmic glow, unseen until now, that may come from stars that float adrift between galaxies. The discovery suggests that as many as half of all stars in the universe lurk outside galactic boundaries. 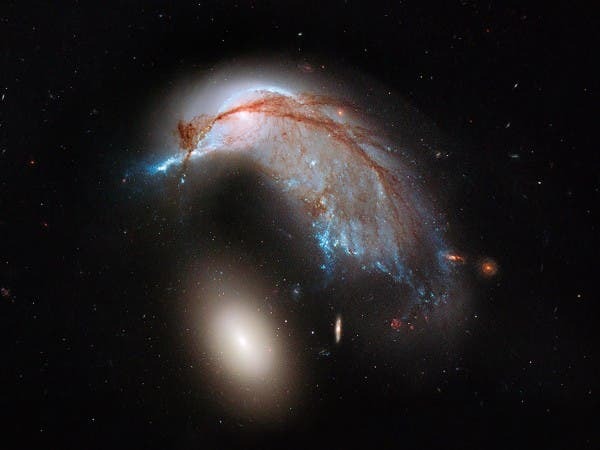 The stars were probably tossed there when galaxies collided (trail of stars from colliding galaxies shown in Hubble above). A team led by astrophysicist Michael Zemcov, of the California Institute of Technology (Caltech) in Pasadena, reports the discovery in the 7 November issue of Science1. The findings come from the Cosmic Infrared Background Experiment (CIBER), which flew briefly into space in 2010 and 2012 aboard a sounding rocket. As CIBER soared above the atmosphere, it looked at five different regions in space for about a minute each, gathering as many particles of cosmic light as possible. The flights took place at different times of year, so that the astronomers could subtract the confounding effects of the zodiacal light, the glow of sunlight that is scattered off interplanetary dust. CIBER was designed to look for fluctuations in infrared light to hunt for signs of some of the first galaxies that formed in the Universe. The light of these galaxies has been redshifted to infrared wavelengths because of the Universe's expansion. But when Zemcov and his colleagues began to sift through CIBER’s data, they realized that the light it captured was not nearly red enough to have come from ancient galaxies. The light must be coming from something closer and more modern, they say — such as ordinary stars. Stars normally reside within galaxies, but can be yanked out by gravitational forces when galaxies collide. Bock suspects that a lot of these renegade stars could have come from relatively lightweight galaxies, which can lose hold of their stars more easily than more massive galaxies. “If this is true, then there is an entire population of stars that's been sitting out there, but because they are individually so faint we can really only see them in ensemble,” says Moseley. Bock and his colleagues are now building a follow-up experiment, CIBER2, which will look at visible rather than infrared wavelengths. They hope that it will reveal new information about the background glow and exactly what kinds of stars could be contributing to it. The Hubble Image at the top of the page shows merging galaxies, like this pair called Arp 142, that may spew stars out into intergalactic space. Seeding the Cosmos! Massive Supernova Event from Merging White Dwarfs or a Single Star?